Cherry City Kitties : Happy Birthday Betty White! We're holding the Momma up in her computer chair so she can get back to business. Frankly we are all getting a bit tired of wearing these little nurse get-ups (especially the hats!!! ), but we are doing our best to help the Momma get better fast. We are also missing the fact that there is currently no "biscut making" on her belly cause it's still oww-wy, and the Daddy doesn't really like it much. Oh well, what's a kitty boy to do? We all thank you again for all the healing purrs and prayers. They help so much. Anyway, Betty White is a big friend to all animals, and, even though we hate a trip to the v-e-t, we agree with her that the best thing to do is to get us spayed or neutered. It's important that, in these times of too many kitties and woofies desparately waiting for forever homes and having to live in shelters, or worse yet losing their lives because there is no place for them, that we kitties take responsibility to not make anymore. Many of us were those kittens once and we know what a hard life it can be, and we don't wish that on anyone. So we thought we'd show you about Betty's campaign "Betty White's Bucks for Balls" (the Momma says it's really funny, but no one gave us any money for ours!!!). If we all sent her $1 for her birthday, think of how many kitties could be spayed/neutered and how many less unwanted kittens would be born. You can visit her at the website "Actors and Others for Animals" to send her a birthday $1 so she can help. We thank all of our friends who have been missing us, and we're sorry we haven't visited you all more. But things are getting better everyday, and we'll see more of you really soon. We love Betty White! She is so funny, and we love that she is such an advocate for all the furries. We'll go and check out the Actors and Others for Animals website now. We too are glad mum is a bit better and thanks for visiting. We are now following. Have a terrific Thursday. We are so glad your Mom is doing some better! Happy Birthday to Betty White, we love her and she is such a hoot! Happy Birthday to Betty! You prepared a beautiful homage! Hey, thanks for your kind visit and comments, your blog is really nice and I love your pictures! doodz...wear we haz been... we dunno... and we dinna noe yur mom had sum sir jerry...we hope her iz on de fast road ta ree coveree...sew fast her gets a speedin ticket.....tell her while it mite sound crazed...if her putz sum trout ore say flounder, mackeral ore sea bass on her cuts...her will be amazed at how fast her will heel, knot ta mesnhun her haza reddy snak...rite ther... N her does knot knead ta go two da kitshun then fora samich !!! Glad to hear the Mom is doing little better. And that Betty White is one special person.We wish her a very Happy Birthday. What an amazing person. Take care. Happy #91 to Betty! Mommy actually got to work with her 2 years ago when she turned 89 - she was in a Hallmark movie and mommy filmed a promotion with her. She was terribly gracious and drew us a picture of her sweet Panda puppy while they were waiting for the camera crew to get the lights all futzed & fixed properly. We especially love that she loves animals and lends her name, her time and her money to helping homeless pets! Sending you guys TONS of get-well purrs to pass along to your humans. Um...and can we request photos? Of the nurse outfits? Be patient with your mommy, guys, sometimes it takes a while to feel good again! We're purring for her! Glad to hear that your Mom is doing little better ! P.S My mom have payed 1$ for "Betty White's Bucks for Balls"
Betty White is awesome - my human's boyfriend used to work at a vet clinic where she knew the owner, so she would come in and visit. I hear she is every bit as cool and as nice as anyone would imagine her to be! OMC! I did not realize that it was Betty White's birthday today. Wishing her a very happy birthday. She is one neat lady and does so much for the furries. We are glad your mum is starting to feel better, and we send her our purrs. We didn't know who Betty White is, but we wish her a Happy Birthday. We hope your Mom starts to feel better soon. Happy Birthday to Betty White!! Happy birthday Mrs. White! :) I hope ur Mom is all better soon! What a lovely post for Betty White! Mommy loves Betty White! A very Happy Birthday to you, Betty White! Me thinks your Mommy has apreciated yous in your hats! Me knows that it makes my Mommy giggle, but purrhaps that is bad for her tummy! 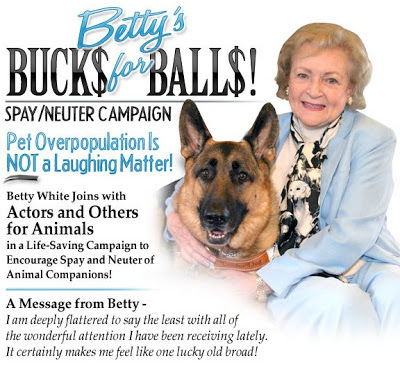 Betty White is one of Mommy's heros, we thinks Bucks for Balls is a great cause!! This is a great post about a lady that makes M & D laugh here too. She's extra neat because she loves animals and works so hard to help them.